Furniture: Comfortable, lightweight chairs permit students to work individually or in groups at their tables. Technologies: Access to resources: LMS, outlets for laptops, internet (via student laptops). Lecture recording permits individual review of courses materials after attending class. Multiple sources and screens for simultaneous display of different learning materials. Acoustics: Acoustic design to avoid distraction from outside and inside sources. Lighting/colour: Appropriate lighting for individual work. Green accents on walls and forest-printed shades make the room more pleasant, while large windows let in ample natural light. Layout: Promotes face-to-face communication through two rows on a tier, so students can turn and discuss in pairs or small groups. Students can move about classroom with ease due to centre and side aisles. Unobstructed sightlines. Furniture: Mobile, lightweight chairs permit students to turn and discuss with those nearby, supporting a variety of collaborative learning approaches. Technologies: Shared workspaces on writable whiteboards at sides of room. Videoconferencing permits collaborating with students at external sites. Acoustics: Sound zones support multiple simultaneous conversations among students. Appropriate amplification is available, with a push-button microphone for students placed every couple of chairs. Lighting/colour: Different lighting patterns and levels support different learning activities. 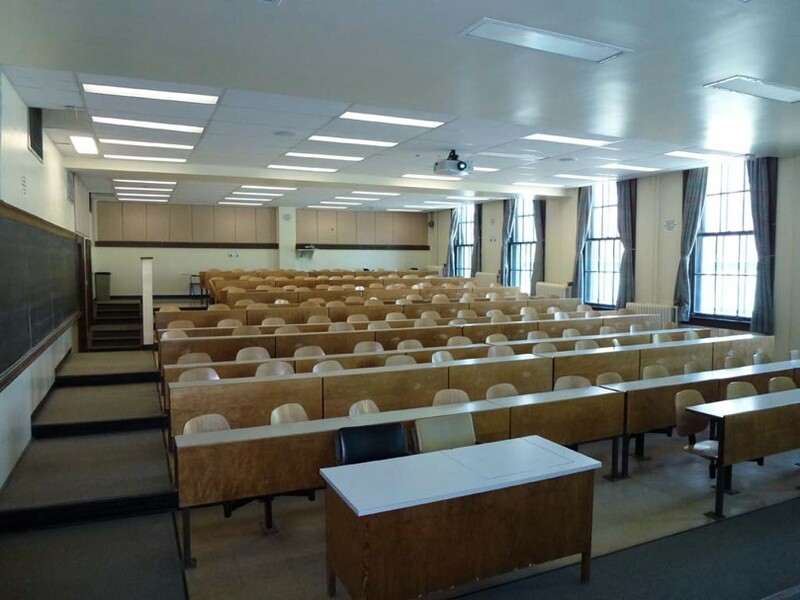 Layout: Instructor is not limited to the “front of the room” and instead has access to all students due to unobstructed sightlines and the aisles. Furniture: The podium does not interfere with sightlines or movement, and has a large surface for instructional materials. Technologies: Dual-source projection, multiple classroom technology sources (document camera, data projector, computer, Sympodium, etc. ), HDMI cables and multiple screens permit display of different learning materials. Videoconferencing feedback screens permit the instructor to view the image on the screen that is being projected to an external site. Acoustics: Sound zones ensure that not only are students able to hear the instructor, but that the instructor is also able to hear the students. Wireless and wired (headset) audio amplification available for instructors. Lighting/colour: Lighting patterns support multiple types of teaching tasks. University standards have been applied, including improvements to lighting and IT consistent with teaching and learning needs. Designed for all populations using the space: well-lit, with standardized room controls to facilitate use of multiple classrooms. 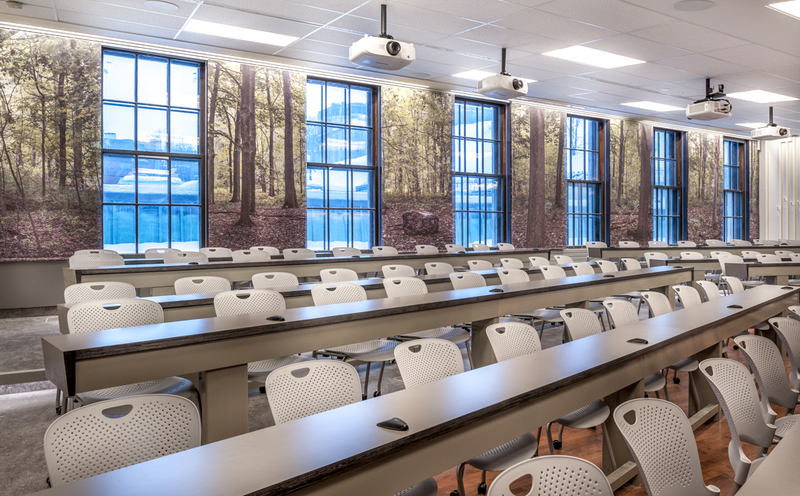 Classrooms that incorporate elements of active and collaborative learning are part of a vision for campus learning spaces of many different sizes. Return to the index of recent classroom improvements.